Foods that are personalizable and luxurious, nature oriented. Our motto is to present and attend to all needs by “Secure and safe” “Delicious” products in this changing world. We always strive and actively try to provide safe and tasty green teas to the world. We have always been striving to assure the food safety and quality of our green teas. But this year, 2016, in order to strengthen our quality management system even more, we acquired FSSC22000. 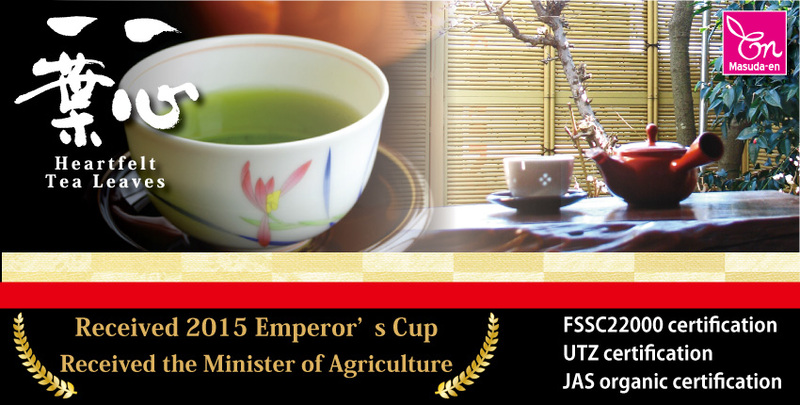 Masudaen make green tea from farming to production to sales. It is located in the northern part of Omaezaki City called Makinohara Plateau. We produce approximately 100,000 kg of green tea annually at our own factory. We are a global company not only selling delicious tea to all over Japan throughout the year but also exporting to the world countries such as North America and Asia. In addition, we are certified by Food Safety Management System FSSC 22000 · Organic JAS and are striving to deliver cheaply delicious tea that can be safely and secure to customers.